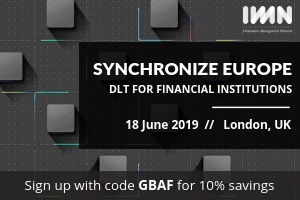 Following the successful debut of Synchronize in New York earlier this year, IMN is excited to announce the launch of Synchronize Europe on 18 June 2019 in London. Synchronize Europe will include coverage on the institutional applications of custody, trading, and servicing cryptoassets, such as Bitcoin. Until now, financial institutions have mostly been skeptical of cryptocurrencies and other cryptoassets as a means for retail payments and speculation. Recently, several notable entities have announced products and initiatives aimed at the institutional integration of these new assets into the existing financial system and our conference will explore the role that cryptoassets play in the financial services industry from a variety of angles: asset definition, futures trading, the role of trading desks, right through to the risks, benefits and role of regulation in and of institutional investment in these assets. For more information, or to register, please visit www.imn.org/synchronizeeurope. Register with code GBAF for 10% savings.